This 36ft Topaz Express Sportfisher out of Los Suenos Marina in Playa Herradura is powered by twin diesel engines. Captain Dana Thomas is at the helm. 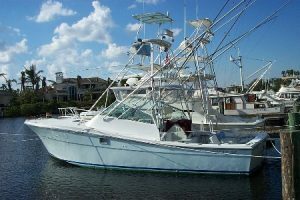 It features a raised tower, Rupp tournament outriggers, Penn downriggers, professionally rigged tournament tackle by Shimano, two live wells, tuna tubes and full electronics including color finder, chart plotter, radar, single-side band radio, VHF and a sound system. It has a full a/c galley with refrigerator, freezer, microwave and a stand-up head/shower.